Ens. 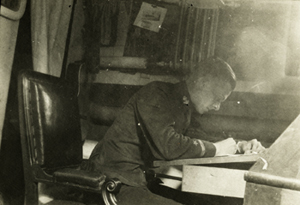 George Perley Morse served as commanding officer of submarine chaser SC 227. SC 227 was a wing boat in Unit F in the Otranto Barrage, based at Corfu, Greece (Base 25). This was one of the chasers that participated in the second excursion to the enemy submarine base at Durazzo, Albania. On 2 October 1918 a group of chasers were involved in the bombardment of Durazzo; then on 11 October 1918 a second group took part in a follow-up mission, finding the base abandoned. This photo set shows rare interior photos from his collection, probably on board SC 227.